Surrounding yourself with meaningful artwork throughout your home is a wonderful boost to emotional health. Creating memories with loved ones, and then reminding yourself daily of what’s important in life, starts with beautiful wall art. Today I want to share some tips on what to think about when creating your portrait display. How many people are in the photograph? Is it a close up or a wide environmental composition? The more people you have, and the further away from the camera they are in the portrait - the larger the portrait size needs to be to effectively convey emotion. How far away from the wall do you typically view the portrait from? If this portrait is going in a narrow hallway, it can be smaller. If it’s going in the living room above the fireplace, typically viewed from the couch in the opposite end of the room - it needs to be larger. How big is your TV? Really, think about this. Would you buy an 11”x14” TV? No? If you have not worked with a professional print artist before, you may have printed “enlargements” at a local drug store in that size, thinking you were going “big”. Dare to go much, much, MUCH bigger! If you have invested in professional portrait creation, ensuring you have the appropriately sized artwork is key in maximizing the impact of your personalized art. Here is an example of a 40”x60” family portrait of 25 people compared to a 16”x24”. With the smaller size, you cannot really make anything out until you get up close and personal to it. Going big makes a much bigger impact! An appropriately sized wall portrait of a family of 25 (40”x60”). A portrait too small for the space it’s in (16”x24”). Sometimes a single, appropriately sized portrait is the most impactful way to decorate one wall. Smaller pieces of wall art can be added in a cluster elsewhere in the home, or displayed on the coffee table or end tables. This is the case with a particularly large piece of wall art, such as the example above. You wouldn’t want to add anything very close to it, as it would create a cluttered look and take away from the large piece impact. 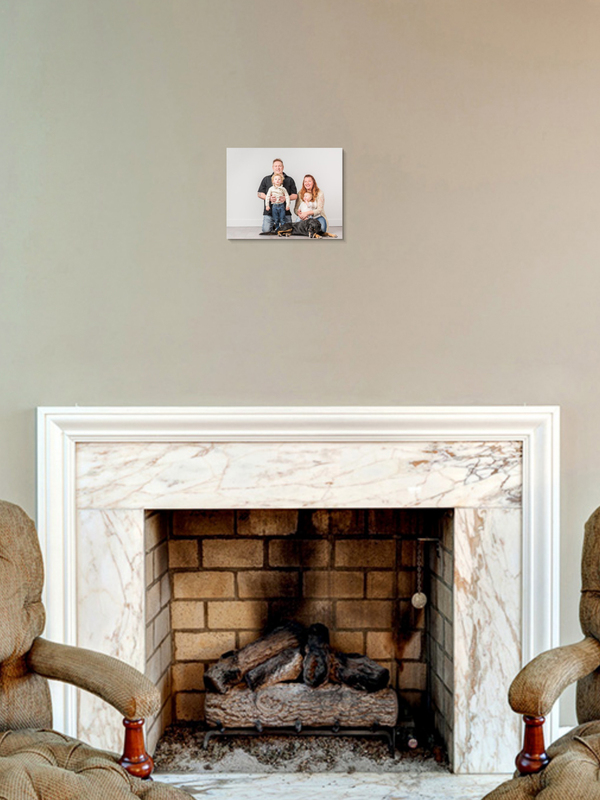 Centrepiece - 24”x30” family portrait is appropriately sized for the mantle, and a smaller grouping of 11”x14” fun moments from the photoshoot help complete the story. A single 11”x14” low impact wall portrait - far too small for the space. Placement - where is your wall space? Bedroom - yes! This is a wonderful space to place portraits that you will get to see every morning. It’s also a great idea to put a portrait on the wall of your child’s bedroom. It helps reenforce the importance of bonds - whether it is family bonds, or a bond with their beloved pet! Staircase or entryway - lots of wall space that you walk past every day. Get creative and create a stairway collage. Slow your stair climbing and smile at your portraits on the way up or down. Bathroom - I know, it sounds strange, but it’s a space we spend a lot of time getting ready for the day. Having a loving memory in there is a wonderful addition to the daily routine. There are options for bathroom-safe wall art, including encaustic or metal art! Shuffle things - if you find that you have your walls completely covered, re-evaluate if it’s all important. You may have bought an inexpensive Ikea wall decoration, but if its entire purpose is to fill the wall - are you not better off swapping it for something meaningful, which brings you joy? Bedroom wall - having portraits of happy memories to wake up to. Largest portrait is in a 16”x20” frame. A metal wall portrait of your bestie - in the bathroom. 20”x30” piece. Stairs or entryway - great spot for a photo collage. These don’t need to be very large, since you will be walking up close to them often. Largest piece is a 16”x20” framed fine art print. 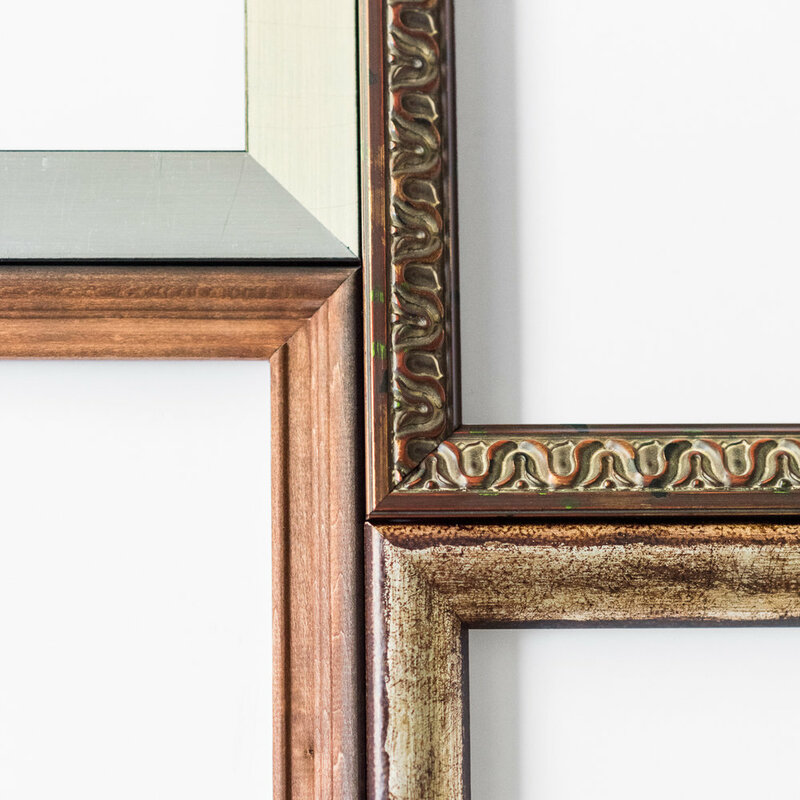 Custom framing brings your artwork to the next level. Second only to the artwork size, I’d say custom framing is the best way to help your art make an impact. I especially recommend custom framing for gift portraits - it really helps make it a unique and stand-out piece of art, ready to claim its place on the wall. I offer my clients a personally curated collection of custom frames to choose from, and also invite them to dig through my stock of unique frames I have curated from various shops at a lower rate. I do the complete framing by hand using archival materials and all the proper hardware right in my workshop. Adding a custom frame makes this matted fine art print really stand out! A sample collection of single one-off frames you may find in my studio. Size: This may be tough to do on your own, but do try it. Tape up a piece of cardboard of a certain wall portrait size to your wall and stand back - imagine how tiny the people’s faces will be in the final piece. Black and white vs. colour: There is nothing wrong with having a mix of both, so long as the style of the portraits is consistent and the colours are of a limited palette. Making a photograph black and white or colour should be done with intention and purpose - does the colour bring meaningful information, or does it obscure what’s really important about the captured moment? Do think about this, and note that professionally transforming a colour image into black and white is an art in itself - beware of single button apps and drugstore print labs that do it without human guidance. 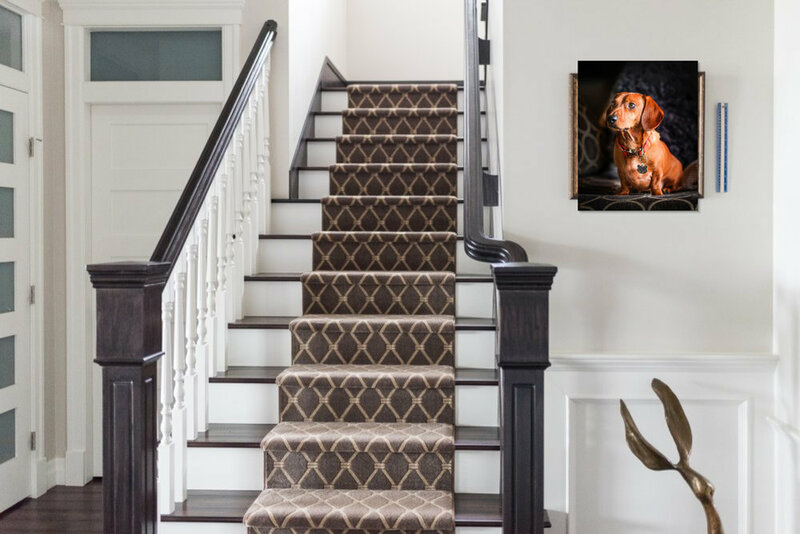 For my clients, I use a specialized software to help us visualize different portraits and groupings on their own walls. 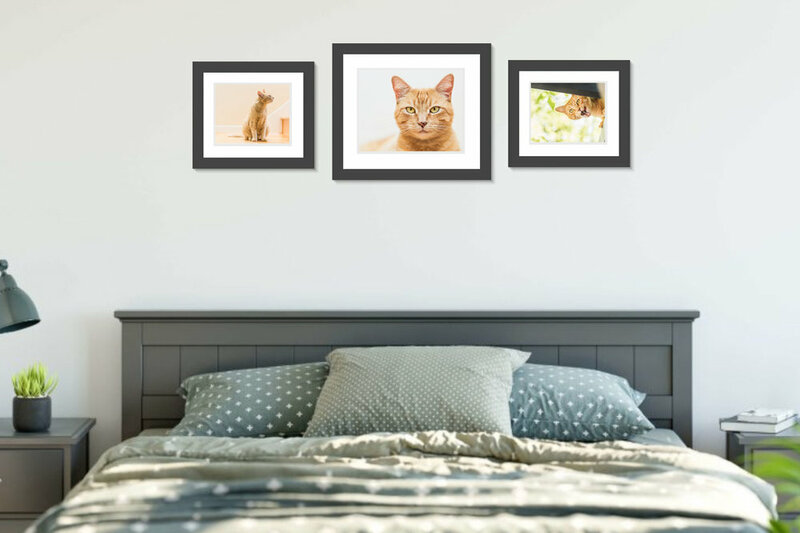 I photograph their walls and then I can play with placing various portraits in different sizes before we finalize their order, so that they are confident they will love their display wall, and have a plan for installation. Custom collage - a single unique frame helps the centrepiece stand out. Colour portraits are of a limited colour palette, so they do not clash with the black and white portraits. Software design of the wall portrait - shows us what it will look like in this size, and on this wall. Client and I are satisfied this is the right portrait for this space, the right size, and it will fit nicely with their interior. The little pop of colour works, and the subtle pattern in the portrait plays off the staircase runner pattern. Actually do it! Don’t let your portraits sit on the computer, or on a USB drive in a drawer. They are no good to anyone in there, and they WILL get lost. Remember floppy disks? But really, printing your photographs and putting them up on the wall is the most effective way to enjoy them every single day! If you are ready to create some lasting memories, have expert guidance in displaying them effectively, and ensuring that the quality is all there to be passed down for generations - get in touch to arrange your complimentary consultation! Newer PostEncaustic art - enhance your existing photograph and turn it into wall art!